How often do you get the opportunity to get hands on with a brand new innovation in a competitive industry like 3D printing? I counted myself lucky to do just that recently when my employer played host to Massachusetts based startup ‘Viridis 3D’ and their new 3D printing System! Due to a partnership between Palmer Manufacturing and Viridis 3D, the showcase above was setup 30ft from my desk. What does this printer do and why is it special? 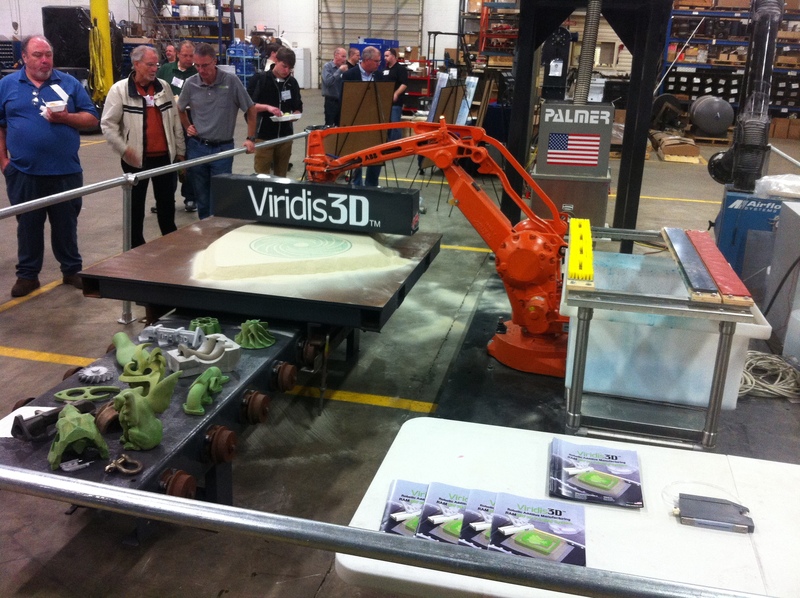 Viridis is focusing their efforts on developing a unique sand casting tool for the foundry industry. They have developed their own version of a powder bed inkjet head 3d printing system that bolts onto a standard ABB 4-axis robotic arm. The arm is also outfitted with a custom sand distributor and liquid pumps. It is programmed to repeatedly deposit layers of sand & liquid chemical binder onto a platform to create any shape you can imagine. 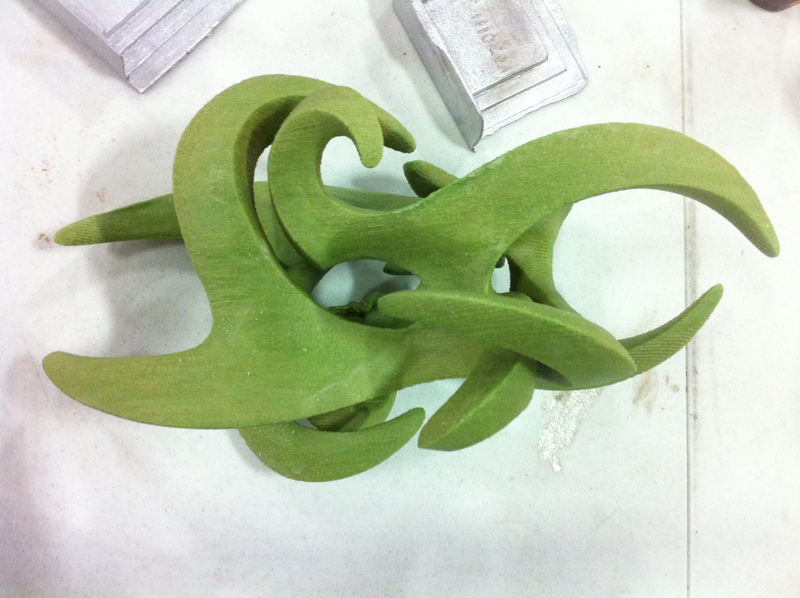 This process was used to make the sand patterns below, shown in their green form ready for investment casting. The printed pattern is consumed in the process of investment casting. One print yields one casting. You can only make something like this with 3D printing. People have 3D printed in sand for casting purposes before, that part is nothing new. Viridis is actually the new guy in this industry, competing against established companies like Voxeljet & ExOne. 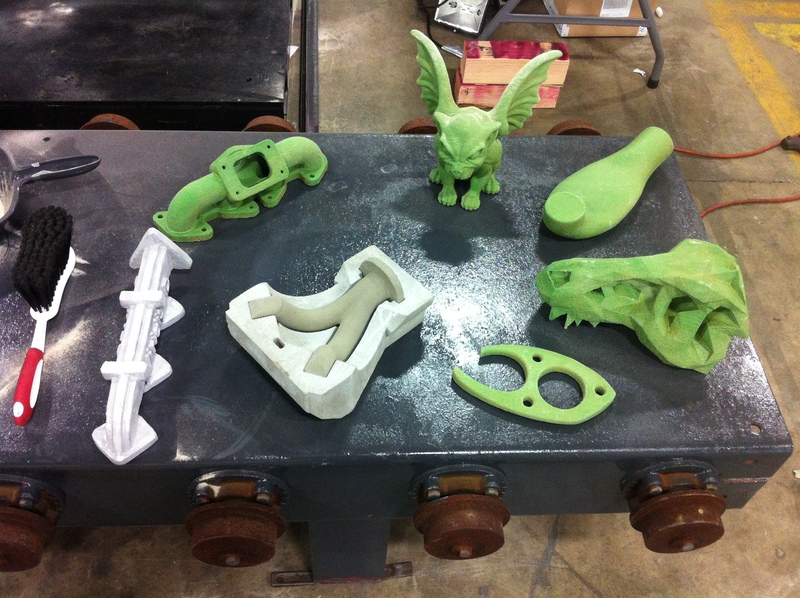 What gives Viridis the courage to enter this market is their innovative method for 3D printing. The really interesting part to me is that aspects of their design might prove useful for the rest of us. Never mind that their product is geared towards sand casting, this printing method could be used on any powdered material. Check out their product video here before moving on. The Robotic Arm: The vast majority of 3D printers you see, both consumer and professional grade, are 3-axis gantry systems. Gantries are great for their simplicity and enable engineers to create machines with an elegant self-contained cubic form factor. However, there is no standard method for designing a gantry. Just look at the variety of consumer grade FDM printers on the market, which are all different versions of gantries. The robotic arm, on the other hand, is a standardized piece of equipment and has been used extensively in industrial applications for years. The programming code has already been written and the arm designs are well tested. Multi-axis arms can carry high loads with great rigidity, move at extremely high speeds, and have a huge range of motion. The Curved Build Area: The physical build area of a robotic arm has far fewer limitations than a closed gantry does. The range of motion is huge and can be approximated as a sphere with its center around the base of the arm. The curved build area then is just a small segment of this sphere, but you could theoretically use much more of the sphere if you wanted. Viridis chose to utilize the entire curved segment rather than cutting off the edges, not to skirt patents as I originally thought, but to make use of the rounded corners and to limit any errors in the robot’s motion to just a single axis. It’s more curved than what is shown above. Multiple Printheads: Existing inkjet systems use a single printhead with one small spray line which necessitates a rapid sliding motion to cover large areas in a reasonable amount of time. Not so with this design. Viridis’s machine can print an entire layer is a single pass because they mounted a dozen printheads next to each other! There is one special consideration to be made due to the windshield wiper-like motion of the printer. When using a line of printheads pivoting around a single axis you need to account for the varying surface speed of the heads because the outer head is moving faster than the inner head. Fortunately, this isn’t difficult to do. An Open Pile: Perhaps the most noticeable feature of Viridis’s printer is that they don’t have a complicated powder distribution system. Existing gantry style inkjet printers have a devoted 3rd axis for lowering the printbed to add powder and a 4th axis for leveling the powder before each and every layer. 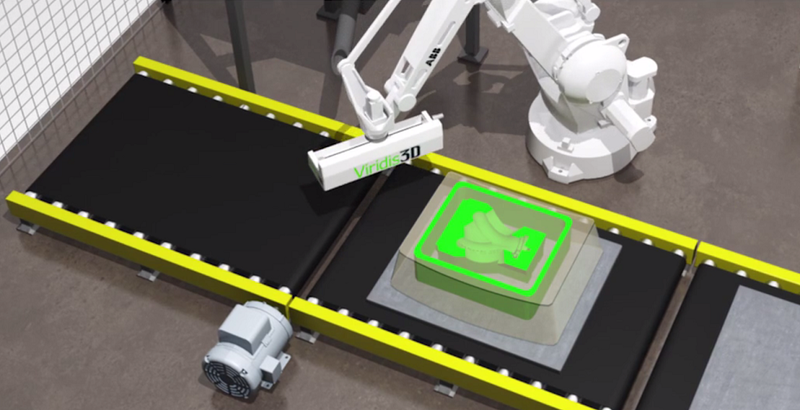 Viridis’s machine is able to do away with the controlled bed and just print on top of an open pile of leveled sand because they print a solid ring around the entire print area. This ring holds all the sand in place and the robotic arm just raises up a little bit to print the next layer. Variable Print Resolution & Large Range of Layer Sizes: White the minimum possible layer thickness is limited by the grain size of the powder, the maximum layer thickness can be considerably larger. If you need a part printed with high detail in some areas and less detail in others then you can print thick layers when possible to reduce overall printing time. Despite Viridis’s clever design, surviving in their niche market will still be an uphill battle. They will have to contend with the limitations of powder bed inkjet 3D printing in addition to foundry specific complications. The immediate hurdle is that parts made with many powder bed inkjet printing materials are very delicate. The printing process also requires a fairly clean environment and parts may require a bit of post processing to remove excess powder material before use. Despite those technical issues my bet is that the Viridis team will figure out methods for making it work on a practical level. The bigger hurdle is that their target market, foundries, are stereotypically laggards for adopting new technologies. For the most part foundries operate on an ‘if it ain’t broke don’t fix it’ paradigm. 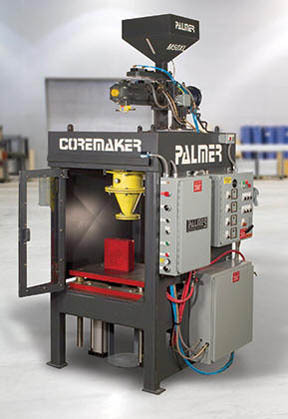 Most of the potential customers for this tech are likely to already own an alternative tool for making molds and mold cores, such as the Palmer Coremaker. Injection molding for sand: This machine blows pressurized sand & chemical hardeners into a formed box. On the bright side a 3D printer and injection molding machine aren’t interchangeable technologies. There is no best way to do anything and each manufacturing method has its own best uses. 3D printing favors customization and is great for small quantity batches of parts. With a 3D printer you can make parts with as much variety and complexity as you want at no additional cost. Plus the printer gives you the flexibility to easily change a product after production has started. On the downside 3D printing can’t offer any economies of scale. It is no cheaper on a per-unit basis to make a large batch of parts than it is to make one. For mass produced parts injection molding is the only way to go because it favors repetition and standardization. For a visual aid I borrowed this great graph from the book ‘Makers: The New Industrial Revolution’ (the book was OK but not great, so no Amazon link today). 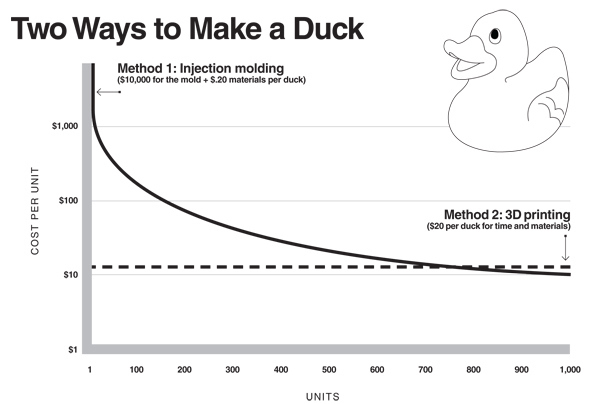 The book uses plastic ducks to illustrate the strengths and weaknesses of injection molding vs 3d printing. I will be interested to see how Viridis leverages the strengths of their new product and the developments they come up with to deal with its current limitations. I wish them the best of luck! Note 1: While I am currently employed at Palmer Manufacturing I should make it clear that all opinions stated in this article are my own and are not affiliated with either Palmer or Viridis. Note 2: 3Dprint.com wrote a couple of articles on Viridis last year, but Viridis was still in experimental mode at that point. The setup shown in the first photo is all new development, so while I hate to post sensationalist headlines I do think it was justified here. This design is freshly proven and I haven’t seen anyone else commercially using this method of 3D printing. Note 3: I was actually able to get very hands on with this machine. Because Viridis’s base of operations is in Massachusetts, I’ve become their maintenance whipping boy and contact here in Ohio. I think the most interesting thing I’ve seen as a result of this is that they’ve created their own slicing software and user interface for the machine. Note 4: Viridis is Latin for green, selected for the environmentally friendly chemicals they use. Another reason to root for the little guy! Previous What do skyscrapers, tractor-trailers, and precision flow meters have in common?